Well made, bomb proof keyboard that can take rage quits, if you want more features, light effects and macro buttons than the K70, then this is your keyboard! Today’s standards for keyboards most often prioritize durability, customization potential, comfort, transportability, and a handful of other important qualities for professional and recreational gamers alike. Considering the purchase of a new keyboard as an investment, we always like to be sure that the keyboard we are testing and reviewing matches up with what the industry is currently capable of producing. Most of all, the keyboard should be balanced when it comes to well-rounded quality. In addition to the sleek design and lightweight yet durable build, another draw for this keyboard over other the markets other top gaming keyboards is its 8MB profile storage. Gamers can now store and access up to three stored profiles on the go, without depending on external software. With this new feature, gamers don’t need to spend as much time setting up, and can spend more time gaming. Back to that brand new LightEdge technology: not only does this keyboard include customizable backlighting for the keys, but it also includes customizable backlighting for each individual key. There is also a nineteen-zone light bar at the top for even more options. 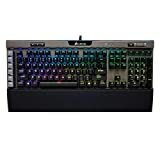 Each gamer is able to customize their keyboard easily utilizing the user-friendly Corsair Utility Engine (CUE) application to select and program multi-colored lighting effects. In addition to its impressive storage and lighting customization capabilities, this keyboard is also cutting-edge in its layout and design of its macro keys. This keyboard offers six programmable macro keys, which is actually less than in previous iterations of this keyboard. The downsizing to six macro keys means that this keyboard is able to be smaller, more lightweight, and more durable, while still keeping the quality functionality of several keys for in-game macros. For gamers, these keys are beautiful texturally and designed to be easy to find mid-game. They are also contoured so that it is much harder to accidentally press them. These macro keys are also customized by using the CUE app, which is somehow able to be incredibly user-friendly without compromising complexity and a variety of options. The designers of this keyboard really took practicality as well as comfort into account in including several timesaving and functional new elements including the dedicated volume and multimedia controls. These controls save gamers the trouble of having to interrupt a game to fix or change the audio. In addition to this, Corsair has also included on this keyboard the capability for optional wrist rests. This is a wonderful investment into the comfort of gamers who play for hours at a time. Even better, instead of forcing it on gamers who buy this keyboard, Corsair makes the wrist rest detachable, so it can be added or taken off easily. The rest is dual-sided and very comfortable. It really makes a difference in comfort after a long gaming session to be able to use the wrist rest, and therefore definitely increases the gaming experience overall. In addition to the sleek design and lightweight yet durable build, another draw for this keyboard is its 8MB profile storage. Gamers can now store and access up to three stored profiles on the go, without depending on external software. With this new feature, gamers don’t need to spend as much time setting up, and can spend more time gaming. In addition to its impressive storage and lighting customization capabilities, this keyboard is also cutting-edge in its layout and design of its macro keys. Offering six programmable macro keys, which is actually less than in previous iterations of this keyboard. The downsizing to six macro keys means that this keyboard is able to be smaller, more lightweight, and more durable, while still keeping the quality functionality of several keys for in-game macros. After the initial inspection of the design and functions of the product, we immediately were excited to see how it matched up to previous keyboards in terms of performance. Our testers were not disappointed. The CUE application was incredibly easy to use, and it was possible to program a series of lighting effects for the keyboard in a matter of minutes. It is also easy to change it in case you change your mind and want to go back to default settings. The keyboard is also incredibly responsive during game-play. The macro keys are a little bit more difficult to program, but ultimately ridiculously worth it. The biggest difference between this keyboard and previous keyboards is that the Corsair K95 RBG has insanely high responsivity. Price: While this is an incredibly quality keyboard from design elements to functionality, the cost is a bit pricey for many hoping to purchase a quality keyboard that is also not too expensive. However, while this keyboard is costly, it is also cost-effective, in that it will not need to be replaced or repaired as soon as other keyboards. In terms of features, design, and performance, there really isn’t a match out there right now for the Corsair K95 RGB keyboard. This keyboard is a worthwhile purchase for any long-term gamer looking for a keyboard that will withstand hours of intense gaming, and possibly traveling from the home control center. It is also a great choice for anyone who would make frequent use of one of its best features, the programmable macro keys. For casual gamers not wanting to fork over the money, this might not be the right keyboard for you, but for anyone even the least bit excited by the 8MB profile storage, the CUE customizable lighting effects, or the dedicated volume and multimedia controls, we recommend this keyboard as a high-quality, cost-effective investment in your gaming experience.